I'm so tired. This blog post is from my Monday to-do list. I'm two days behind in life, people. I had a crazypants weekend. At least for me... seeing as my weekends usually involve baking cookies and dates with my PVR. But not this week, no siree! I had a real girls night on the town like I haven't had in a long time and it was a blast. I had so so so much fun. But holy man I am so so so so tired. I am currently working on building my immune system up again, after treating it like a crash test dummy. Oh, right! Shrimp! These were really, really good. I, umm... don't really know what else to tell you about them. We've made them three times in two weeks. And I really haven't been cooking that much at all. That's saying something coming from me, as I rarely like to repeat meals. They are just simply the most flavourful little shrimp I have ever had. Make them! 1. Brine the shrimp: Dissolve the salt and sugar in a large bowl of cold water. Add the shrimp. There should be enough water to cover the shrimp by about an inch. Stir, cover, and leave the bowl in the fridge for at least 30 minutes. The longest I have left it is slightly over an hour, but I imagine you could leave them for a few hours without any trouble. Longer than that and they might be overly salty though. 2. In a separate bowl, combine the spices, maple syrup, and oil, whisk to combine. 3. Drain the shrimp and pat them dry with a paper towel. Add the shrimp to the marinade, stir to coat and let them sit for a while (10-30 mins). 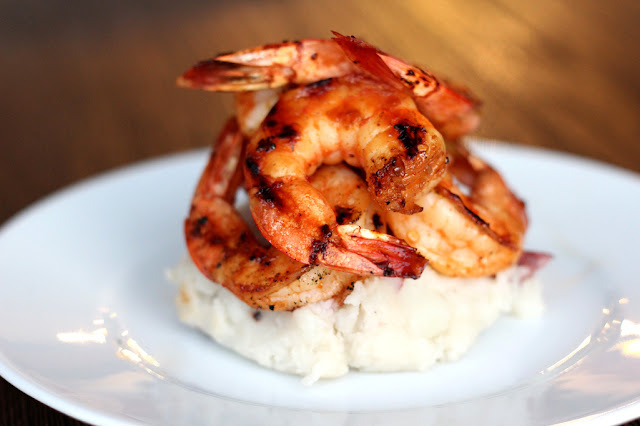 The longer you wait, the more flavorful your shrimp will be! 4. 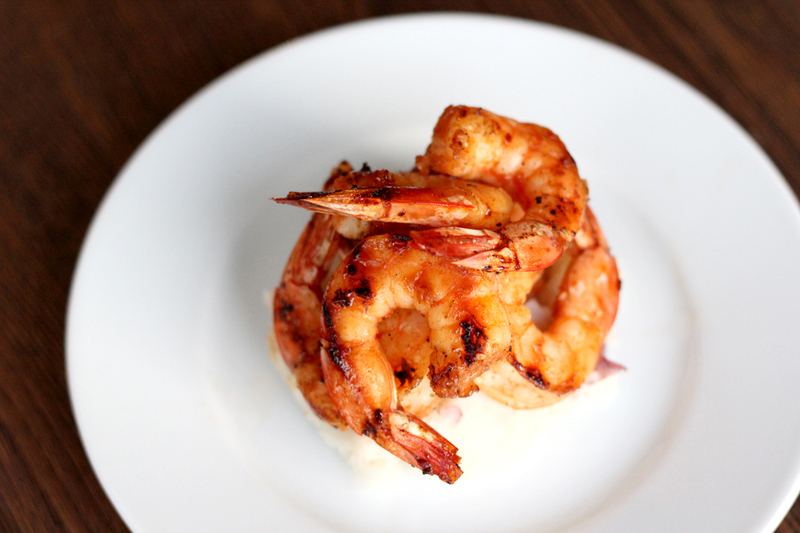 Grill the shrimp for 4 to 5 mins over high direct heat (less if your shrimp are smaller). Use tongs to gently flip them over after about 2 minutes. You can baste with any remaining liquid every so often, so as not to waste any of that flavour! Serve on a bed of cheesy polenta or garlic mashed potatoes, throw them on top of a big farmers market salad, or serve them on their own as an appetizer! 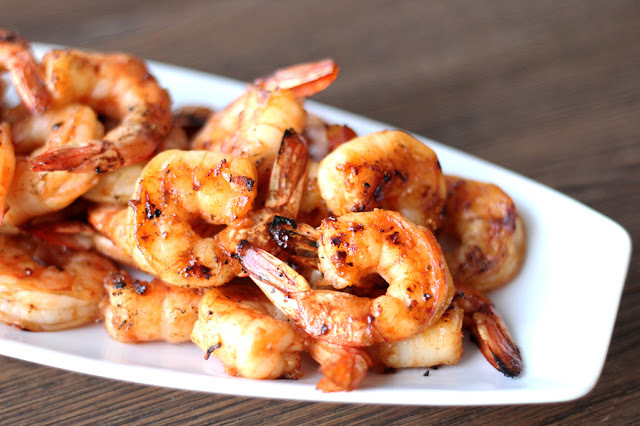 * Use a grill pan if the grates on your grill are farther apart, ours are pretty tiny so there isn't much risk of the shrimp falling through, and we like the crispy grill marks you get from grilling them directly. Skewers would work too. *These would be awesome done in a cast iron pan too, just throw them in a hot pan along with the marinade and let it reduce down to a sticky sauce. Mmm! *One word... TACOS. Pinch those tails off of the shrimp , put em in a corn tortilla and top with avocado, cilantro, and a squeeze of lime. SO. DOING.THIS. Naptime. See ya next week ! This looks delicious. Do you think I can do this on an indoor grill and get the same flavor? Thanks! I will be making this tonight. These look awesome! Can't wait to try. We have a grill basket to use on our outdoor grill. Well, I think your readers wouldn’t mind the late post as long as you entice them with your mouth-watering recipes. 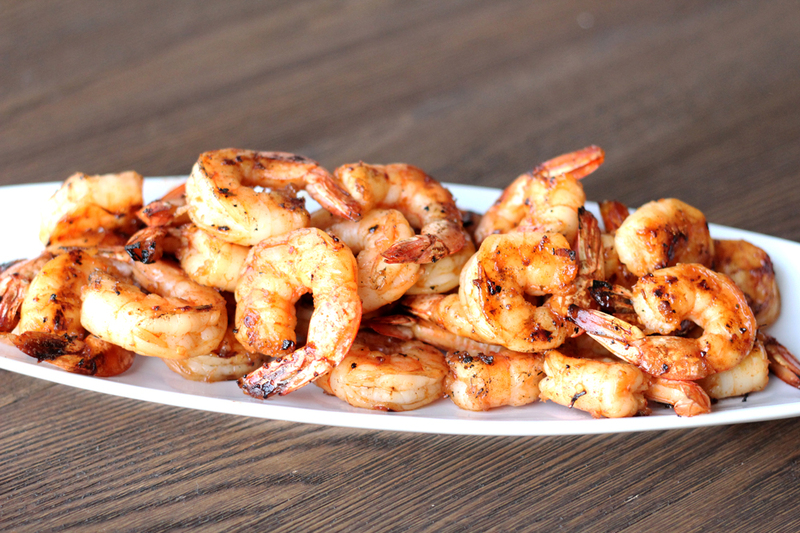 And who would have thought you could use maple syrup in grilled shrimp? That sounds new. But, I guess this dish has a sweet and spicy taste that you would want to get more! Thanks for sharing this one! Just made these shrimp last night out on the grill. Delicious! We skewered them on bamboo sticks with small chunks of fresh pineapple. The sweetness of the pineapple helped tame the heat of the shrimp. They were amazing! Added bonus, the shrimp didn't fall through the grill. Thanks for the recipe! Forex broker bonuses surprisingly, these unproven and untested products are extremely popular these days, generating great profits for their sellers, but little in the way of gains for their excited and hopeful buyers. The logical defense against such magical items is in fact easy. If the genius creators of these tools are so smart, let them become millionaires with the benefit of their inventions. If they have no interest in doing as much, you should have no interest in their creations either. Would these work on skewers on a cookie sheet in a hot (450 degree) oven or broiler? I don't have a barbecue grill, but these sound amazing! I realize you asked this question over a year ago, but I just made this recipe using my broiler set on high tonight about a minute and a half per side and they were AMAZING! Looks wonderful,and I bet they are great! But I can't make such a declaration.” Huckabee, who ran in 2008, Salomon Speedcross 3 Pas Cher flirted with doing so again 2012 but decided against it. This time, allies say, he is chaussure salomon pas cher serious again. He has launched a political action committee, written another book, and quit his exceptionally lucrative television job. “Last time his soldes salomon chaussure heart wasn’t in it,” said one former aide.